UPDATE 48 (2012-5-2): The UNSC sanctions three additional DPRK organizations. See UNSC documents here, here, and here. The U.N. Security Council ordered all countries Wednesday to freeze the assets of three North Korean state-owned companies to punish Pyongyang for its failed rocket launch last month. The April 13 long-range launch, which Pyongyang called a failed attempt to put a satellite into space, violated earlier Security Council resolutions prohibiting North Korea from engaging in nuclear and missile activity. The rocket broke into pieces shortly after liftoff. The Security Council’s committee that monitors sanctions against North Korea approved the sanctions Wednesday and ordered all countries to freeze the assets of the three companies. The European Union, U.S., Japan and South Korea proposed additional entities for sanctions, but the committee acts by consensus and China, North Korea’s closest ally, only approved the three companies. The three sanctioned companies — Green Pine Associated Corporation, the Amroggang Development Banking Corporation and The Korea Heungjin Trading Company — play a role in financing, exporting and procuring weapons, the U.S. Mission to the U.N. said in a statement. Green Pine is responsible for about half of the arms and weapons exported by North Korea, the U.S. statement said. Amroggang Development Banking is managed by Tanchon Commercial Bank, which is “the main North Korean financial entity for sales of conventional arms, ballistic missiles and goods related to the assembly and manufacturer of such weapons,” the statement added. It described Korea Heungjin as a trading company that has been used to procure an advanced digital controller with applications in missile design. Rice said the sanctions committee also approved additional items and technology that are prohibited for transfer to or from North Korea on two key lists dealing with missiles and nuclear-related material, and approved a new work plan for the committee’s panel of experts aimed at intensifying efforts to monitor and improve the implementation of sanctions. The Missile Technology Control Regime, a group of 34 countries, monitors the transfer of missile equipment, material and related technologies that can be used to deliver weapons of mass destruction. The Nuclear Suppliers Group comprises countries that have established export rules to prevent the proliferation of nuclear weapons. Both list items banned for export; they were last updated in 2009. The Security Council unanimously approved a presidential statement on April 16 strongly condemning the failed rocket launch. The council gave the sanctions committee, which includes all 15 council members, 15 days to prepare new additions for the sanctions list. The European Union proposed about 40 additions to the sanctions and the missile and nuclear lists, and the United States, Japan and South Korea also submitted lists, diplomats said, speaking on condition of anonymity because talks have been private. China did not respond until just before the deadline Tuesday night, and approved sanctions against the three companies and updates to the two lists, the diplomats said. It was third time in six years that the Security Council imposed sanctions against North Korea. The council blacklisted eight entities — six trading companies, a bank and the General Bureau of Atomic Energy — and five individuals after North Korea’s nuclear tests in 2006 and 2009. The United States, South Korea, Japan and European nations have submitted to the U.N. Security Council’s North Korea sanctions committee lists of individuals and firms they want blacklisted after Pyongyang’s recent rocket launch, envoys said on Monday. Earlier this month the 15-nation council strongly condemned North Korea’s April 13 rocket launch, called for adding new names to the list of those hit by existing U.N. sanctions and warned Pyongyang of further consequences if it carried out another missile launch or nuclear test. “So far the United States, European council members, South Korea and Japan have proposed new designations ahead of tomorrow’s midnight deadline (to agree on new names),” a council diplomat told Reuters on condition of anonymity. It was not immediately clear which firms and individuals the council would blacklist, assuming it reached agreement. The Security Council imposed sanctions on Pyongyang in response to its 2006 and 2009 nuclear tests. China, North Korea’s protector on the Security Council and a permanent veto-wielding member, also backed the council’s “presidential statement” from two weeks ago, ensuring its unanimous adoption. The statement gave the council’s North Korea sanctions committee 15 days to propose new sanctions listings. “That deadline might be extended for a few days to give China a little more time to think about the proposed designations,” another council diplomat said. The deadline for agreement is midnight EDT on Tuesday (0400 GMT on Wednesday). “It looks as if China won’t stand in the way of an agreement (on expanding the sanctions list) though they won’t necessarily accept adding all the proposed individuals and entities,” he added. Several other Western diplomats said they also expected China would agree to an expansion of the U.N. blacklist. Diplomats say that if the committee can agree on adding new names to the blacklist, it will be a further sign of Beijing’s irritation with its hermit neighbor over a satellite rocket launch North Korea had been widely urged not to carry out. The North Korea sanctions committee includes all 15 council members. It works on the basis of consensus, which means any individual council member can block agreement. The U.N. blacklist includes individuals facing international travel bans and asset freezes, companies whose assets are to be frozen and goods that North Korea is not allowed to export or import. The current list includes eight companies and five individuals. Under two Security Council sanctions resolutions from 2006 and 2009, North Korea is barred from importing nuclear and ballistic-missile technology, as well as luxury goods. This week U.S. Defense Secretary Leon Panetta said China has provided some assistance to North Korea’s missile program, possibly violating U.N. sanctions on the country. Beijing has denied the allegations, but Panetta says that China must do more to bring North Korea to the negotiating table. Beijing has long been Pyongyang’s most important backer, providing key economic support and acting as an international advocate during times when tension escalates between Pyongyang and other countries. Mike Chinoy is a Senior Fellow at USC’s U.S.-China Institute and has traveled to North Korea 15 times. He says there are signs that despite the close ties between the two, China may be re-evaluating its relationship. “I think Beijing has been taken aback by the North Korean decision to stage the satellite launch and by the generally tough and somewhat truculent tone that the North Koreans have adopted. It’s a problem for the Chinese, because they don’t really like what the North Koreans are doing,” Chinoy explained. UPDATE 45 (2012-4-17): KCNA publishes the DPRK’s denunciation of the UNSC presidential statement and announces the scrapping of the “leap day deal“. See the KCNA article here. South Korean Unification Minister, Yu Woo-ik, announced the ROK will continue humanitarian aid. The U.N.Security Council on Monday strongly condemned North Korea’s rocket launch, announced it will impose new sanctions, and warned that it will take further action if Pyongyang conducts another launch or a new nuclear test. The Security Council adopted a resolution imposing sanctions against North Korea after its first nuclear test in 2006, and stepped up the sanctions after its second test in 2009. U.S. Ambassador Susan Rice, the current council president, said the speedy adoption of the statement “shows that the international community is united” in sending a strong message to North Korea and said its companies dealing in nuclear technology would be added to the sanctions list. The council said it asked the Security Council committee monitoring sanctions against North Korea to prepare new additions for the sanctions list within 15 days, and said if it doesn’t the council itself would take action within five days to expand the sanctions list. The council expressed “its determination to take action accordingly in the event of a further DPRK launch or nuclear test,” the statement said, using the initials of the Democratic People’s Republic of Korea. You can read the UNSC Presidential Statement here (PDF). You can also read it on the UNSC’ press release on the topic. The rocket failure had raised conjecture that the North Korean leadership might embark on a purge to assign blame. But video footage from a large military parade on Sunday in Pyongyang showed that two party officials in charge of the North’s defense industries — Pak To-chun, party secretary for munitions industries, and Ju Kyu-chang, director of the party’s department for machinery industries — were present in their military uniforms. Another important official connected to the North’s nuclear and missile programs, Paek Se-bong, head of the country’s Second Economic Commission, retained his seat on the country’s powerful National Defense Commission. Also on Monday, Choson Sinbo, a pro-North Korean newspaper in Japan that often speaks for the North’s government, said North Korea would embark on developing a rocket much bigger than the Unha-3, the rocket that disintegrated Friday a few moments after liftoff. The Unha-3 took off from a new launching pad near the western border with China. Experts who have examined the site through satellite imagery have said it was designed for bigger rockets than the Unha-3. The 90-ton rocket launched at 6:39 p.m. ET Thursday, but 81 seconds into the launch the U.S. detected a substantially larger than expected flare and by 10 minutes after launch, the rocket was no longer on several radar screens, U.S. officials said. Had the launch been successful, the rocket’s third stage was expected to burn up in the atmosphere about 10 minutes after launch, with debris falling north of Australia. During the scramble, Flanagan said, one of his government minders grabbed him and told him to get ready -– not for any news conference on the launch, but for a music festival scheduled for that day. “He had no idea that the rocket had failed and when I told him what had happened, he looked astonished and walked away,” said Flanagan, who was furiously relaying the peculiar developments on Twitter. The deflating scene appeared to be repeating itself across the closely guarded Yanggakdo International Hotel, located on an island and therefore nicknamed Alcatraz. BBC reporter Damian Grammaticas, who’d been up all night working, was awakened by his Beijing bureau chief, Jo Floto, to learn of the news. “The rest of the world knew but nobody in North Korea knew that the rocket had launched,” Floto said. By then, it was clear that the only people the reporters would be breaking news to were the very individuals they had counted on for the latest information. “Covering this rocket launch from Pyongyang seems to me like covering the Super Bowl from the Superdome equipment storage locker,” tweeted Chico Harlan, a correspondent for the Washington Post in Seoul. At the very least, the journalists thought they’d get to watch a feed of the launch on television, Flanagan said. On Thursday, North Korean officials were seemingly preparing the hotel’s media center, a circular room with tiered seating and Internet access. Large screens were put up and speakers checked. Broadcast crews staked out positions for prime views. Though they ultimately had no scoop, the massive media attention may have pressured the country’s new leader, Kim Jong Un, to issue the stunning admission of failure later that day. Press invitations to North Korea are scarce, and news organizations, including the Los Angeles Times, ordinarily leap at the opportunity to look at life inside the cloistered state -– even if it means absorbing a lot of propaganda along the way. For days before the rocket launch, the press corps were led through carefully choreographed tours and events. They watched the unveiling of a massive mosaic of former leader Kim Jong Il, who died in December. They visited a fruit processing plant adorned with a giant mural of the deceased leader. A trip to Kim Il Sung University provided interviews with students. Each stop was supposed to highlight the regime’s enduring strength. But like the surprised reaction of minders Friday, the country’s brittle condition always remains in full view. Launching Station in Cholsan County, North Phyongan Province at 07:38:55 a.m. on Friday. Scientists, technicians and experts are now looking into the cause of the failure. Here is admission of the failure announced on North Korean television. This admission of failure is contrary to the established practice of declaring the satellites achieved orbit despite facts to the contrary. Martyn Williams pointed me to this ground level photo which matches the satellite image. A friend also sent in this article on the launch (which is well worth reading) and this explanatory graphic. Information on the other events taking place in the DPRK this week will be posted over the weekend. UPDATE 36 (2012-4-11): Foreign media, correspondents, and experts have been taken to the DPRK’s General Launch Command Center. See footage on KCNA here. 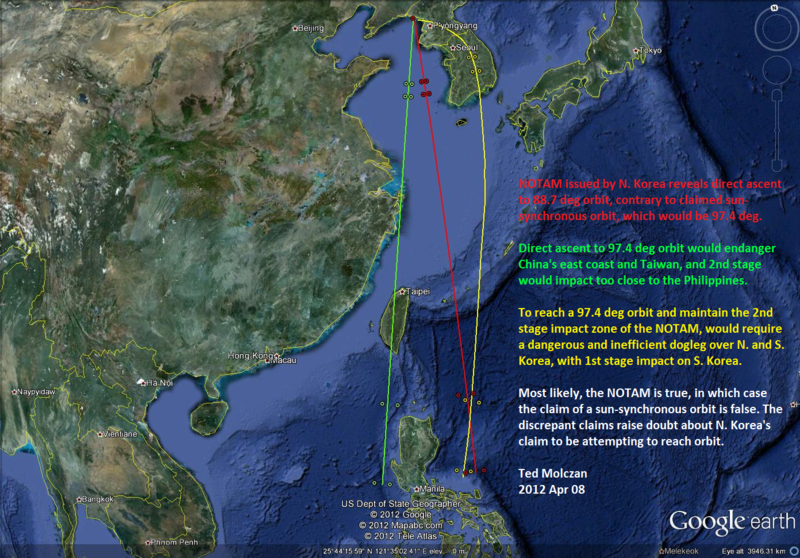 UPDATE 33 (2012-4-10): The DPRK’s announced rocket trajectory and flight path needed to reach orbit are inconsistent. See here and here. UPDATE 32 (2012-4-10): 38 North published a 3-D flight path overlay for Google Earth. UPDATE 31 (2012-4-10): Jeffrey Lewis posted a helpful FAQ document on the launch. Additionally, ArmsControlWonk published (Via the Nelson Report) the full text of a letter from Kim Kye-gwon to Glyn Davies. Meanwhile the Philippine Airlines said in a statement that it will change the flight path of about a dozen flights between Manila and the United States, Canada, Japan and South Korea. JAL said in a notice that the flight paths of four flights between Tokyo and Manila, Jakarta and Singapore would be adjusted, leading to an increase in flying time by five to 20 minutes. ANA announced changes to the flight paths of five flights between Tokyo and Singapore, Manila and Jakarta, but said that flight schedules will not be affected. Pyongyang, April 8 (KCNA) — Foreign media persons and experts on space science and technology Sunday toured the Sohae Satellite Launching Station situated in Cholsan County of North Phyongan Province. The DPRK announced its plan to launch the first working satellite on the centenary of the birth of President Kim Il Sung. Scientists and technicians of the DPRK are set to launch Kwangmyongsong-3, the earth observation satellite, manufactured by their own efforts and with indigenous technology in the wake of its successful launch of two experimental satellites pursuant to the DPRK government’s policy on space development and peaceful use. This is an inspiring deed and an event of historic significance of the nation as it demonstrates the leaping development of space science and technology of the country. It is a law-governed requirement of the age of science and technology and a worldwide trend to develop and use the working satellite needed for the country’s economic development. Kwangmyongsong-3, the creme and an integral whole of latest science and technology, took on its appearance as a working satellite in line with the international standard and a firm material and technological foundation has been laid for its launch and normal operation, providing a sure guarantee for its credibility and security. As reported, the Korean Committee for Space Technology organized the visit as an exception, going beyond international practice, to show the peaceful nature of the satellite launch in a transparent manner. The visitors first went round a test site of the satellite launching station. They saw the general distribution map of the launching station and earth observation satellite Kwangmyongsong-3. They were briefed on the mission and performance of the polar-orbiting earth observation satellite: It will gather necessary information on the distribution of forestry resources in the country, severity of natural disasters, crop estimate, weather forecast and survey of natural resources during polar orbit. They viewed the carrier rocket Unha-3 on the launch pad. Seeing the satellite and carrier rocket whose transparency is ensured to the maximum, they had deep understanding of the fact that the DPRK’s satellite launch is aimed at space development and use for peaceful purposes from A to Z. They were admired to learn that the space science and technology of the DPRK has entered the practical stage of satellite after going through an experimental stage and reached such level where it can choose the position of satellite launch and the direction of its launch as it wishes. They learned in detail about the preparations for launching the satellite in the General Launch Command Centre. The visit to the launching station for the working satellite Kwangmyongsong-3 which will contribute to promoting the international confidence and boosting cooperation in the field of space scientific research and satellite launch offered the visitors an opportunity to realize the might of another space power advancing towards the world standards by pushing back the frontiers of latest science and technology. All three stages of the rocket were visibly in position at the launch pad, and fueling will begin soon, Jang Myong Jin, general manager of the satellite station, told reporters during a tour of the Tongchang-ri facilities. He said preparations were well on track for liftoff and that international space, aviation and maritime authorities had been advised of the plan, but did not provide exact details on the timing of the fueling or the mounting of the satellite. The 100-kilogram (220-pound) satellite is designed to send back images and information that will be used for weather forecasts as well as surveys of North Korea’s natural resources, Jang said. He said a western launch was chosen to avoid showering neighboring nations with debris. Two previous satellites, also named Kwangmyongsong, or Bright Shining Star, were experimental, but the third will be operational, he said. The Daily NK also reports that the satellite will allegedly play recordings of North Korean songs dedicated to the leaders. UPDATE 28 (2012-4-6): 38 North on some of the logistics of preparing for the launch. UPDATE 27 (2012-4-6): Martyn Williams posts recent satellite imagery of the launch facility. North Korea started developing ballistic missiles in the mid-1970s. It produced Scud-Bs with a range of 300 km and Scud-Cs with a range of 500 km and deployed them along the frontline in the 1980s. The South Korean military estimates that North Korea has spent US$3.1 billion on developing and testing long-range ballistic missiles so far. The rocket North Korea is preparing to launch soon is apparently 32 m long, the same as the Taepodong-2 that was launched in April 2009 with a maximum range of 6,700 km. The new missile is believed to be larger and equipped with a bigger booster that gives it a maximum range of more than 10,000 km, making it capable of reaching the continental U.S. This month’s long-range rocket launch will cost North Korea some US$850 million, the equivalent of feeding 19 million people for one year, intelligence authorities in Seoul estimated Monday. According to the estimate, revealed by a military official, construction of the launch site is expected to cost the North $400 million, while the rocket and its payload will cost $300 million and $150 million, respectively. The North says the rocket launch set for sometime between April 12 and 16 is designed to put an earth observation satellite into orbit. Pyongyang also says it has a sovereign right to fire the rocket for the peaceful exploration of space, though the launch is widely seen as a disguised test of international ballistic missile technology banned under a U.N. resolution. The Seoul official said that the rocket’s expenses of $850 million are enough to buy 2.5 million tons of corn from China and thus can feed 19 million of the North’s 24 million population for a year. “North Korea has suffered a deficit of 400,000 tons of food every year. So, the money could resolve the problem of food shortages for six years,” the official said. Separately, North Korea is expected to spend $2 billion to celebrate the 100th anniversary of the birth of late President Kim Il-sung, the country’s founder and grandfather of current leader Kim Jong-un, which falls on April 15, according to the official. “Through recently disclosed satellite photos of North Korea’s missile launch site in Tongchang-ri, Cholsan County, North Pyongan Province, we have confirmed that a tower crane has been set up at the launch pad,” a high-ranking South Korean government official said. “North Korea initially planned to set up gantry scaffold for the assembly of rockets in Tongchang-ri, but its construction has been delayed due in part to budget shortage. In a typical launch process for three-stage rockets, the rockets are assembled horizontally on land and then erected vertically, or they are assembled on the gantry scaffold and then moved to the launch pad. The North, however, appears to be moving the first-stage rocket to the launch pad then mounting the second-stage and third-stage rockets one by one onto the first rocket, assembling all three directly at the launch pad, the official said. That explains why the North moved the rockets from Pyongyang to the launch site on or around March 23, a week earlier than expected, the official said. In a book it published in 1999 featuring what it thought to be common knowledge about satellites, the North drew a concept graphic of a rocket launch site including gantry scaffold. The official said the construction of the Tongchang-ri missile base started in 2000 but was put on hold due to budget problems. The official said there is a possibility that some other necessary facilities such as injection facilities of fuel or oxidizing agents have not been completed at the North’s Tongchang-ri base. UPDATE 22 (2012-4-2): The Philippines is protesting the North Korean launch. UPDATE 21 (2012-4-1): DPRK issues second NOTAM blocking airspace between Bodok and Tomuk waypoints. 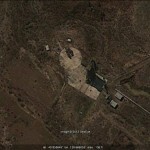 UPDATE 20 (2012-4-1): 38 North: New Evidence of Advanced Preparations for DPRK Rocket Launch. AP coverage here. UPDATE 15 (2012-3-28): US suspends food assistance program. A vice director of the Space Development Department of the Korean Committee for Space Technology (KCST) was interviewed by KCNA Wednesday as regards the planned launch of the earth observation satellite Kwangmyongsong-3. Q: What is the mission of Kwangmyongsong-3, first working satellite in the DPRK? A: Kwangmyongsong-3 as an earth observation satellite will assess the distribution of forests and natural resources of the DPRK, the level of natural disaster, the crop estimate, etc. and collect data necessary for weather forecast, natural resources prospecting and others. We will organize special visits going beyond the international usage to show with transparency the peaceful, scientific and technological nature of the satellite. 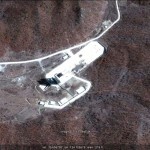 UPDATE 13 (2012-3-27): Martyn Williams posts recent satellite images of the Sohae Launch Facility. North Korea gave details for the first time of a “weather satellite” it plans to send into orbit next month, a launch the West sees as a disguised ballistic missile test which has prompted criticism from the reclusive state’s only major ally, China. The North’s KCNA news agency described it as an “advanced geostationary meteorological satellite data receiver” as world leaders gathered in the South Korean capital, Seoul, for a nuclear security summit. “Kwangmyongsong-3 (Bright, Shining Star), a working satellite to be launched in April, will be greatly helpful to the study of weather forecast needed for agriculture and other economic fields,” KCNA said late on Monday. UPDATE 11 (2012-3-25): The New York Times reports that a rocket has been moved to a launching pad. UPDATE 9 (2012-3-21): Martyn Williams posts the NOTAM issued for the rocket launch. UPDATE 8 (2012-3-21): Martyn Williams posts the documents the DPRK submitted to the IMO. 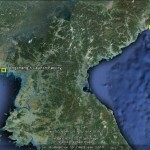 UPDATE 7 (2012-3-20): Martyn Williams offers technical information on the DPRK’s satellite. UPDATE 6 (2012-3-20): China announces its concerned over the DPRK’s announced satellite launch. UPDATE 5 (2012-3-20): The US announces it is suspending the search for the remains of MIAs in response to the planned missile test. UPDATE 4 (2012-3-20): Martyn Williams offers some technical information on the “satellite”. 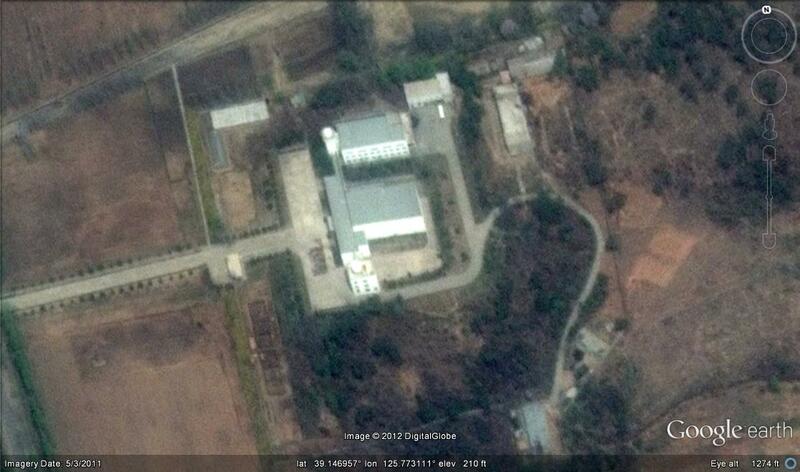 UPDATE 3 (2012-3-19): DPRK invites IAEA inspectors to Yongbyon on same day it announces launch of Kwangmyongsong-3. UPDATE 2 (2012-3-19): Martyn Williams offers DPRK stamps of previous rocket launches. UPDATE 1 (2012-3-19): KCNA claims that the “satellite launch” does not violate the lead day nuclear deal. Pictured above (Google Earth): The approximate locations of the DPRK’s two long-range missile platforms. Pictured above (Google Earth): (L) The Sohae Satellite Launching Station (AKA Tongchang-ri launch facility) in Cholsan County, North Pyongan Province–site of the “Kwangmyongsong-3 launch”. 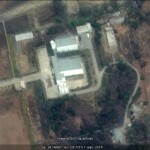 (R) The Tonghae Satellite Launching Ground (AKA Musudan-ri launch facility) from where the DPRK claims it launched Kwangmyongsong 1 and 2 satellites. All the satellite launches have been cover stories for long-range missile tests. The DPRK is to launch a working satellite, Kwangmyongsong-3, manufactured by itself with indigenous technology to mark the 100th birth anniversary of President Kim Il Sung. A spokesman for the Korean Committee for Space Technology said this in a statement Friday. After successfully launching two experimental satellites, DPRK scientists and technicians have steadily conducted scientific researches to develop and utilize working satellites indispensable for the country’s economic development in line with the government’s policy for space development and peaceful use. Through the researches they have made a drastic progress in the field of space science and technology and laid solid material and technological foundations for working satellite launches and operation. Kwangmyongsong-3, a polar-orbiting earth observation satellite, will be blasted off southward from the Sohae Satellite Launching Station in Cholsan County, North Phyongan Province between April 12 and 16, lifted by carrier rocket Unha-3. A safe flight orbit has been chosen so that carrier rocket debris to be generated during the flight would not have any impact on neighboring countries. The DPRK will strictly abide by relevant international regulations and usage concerning the launch of scientific and technological satellites for peaceful purposes and ensure maximum transparency, thereby contributing to promoting international trust and cooperation in the field of space scientific researches and satellite launches. The upcoming launch will greatly encourage the army and people of the DPRK in the building of a thriving nation and will offer an important occasion of putting the country’s technology of space use for peaceful purposes on a higher stage. The Sohae Satellite Launching Station (AKA Tongchang-ri launch facility), long watched by western security experts, has previously never been used for a long-range missile launch. 1. Previous posts on the Unha 1 and Unha 2. 2. Joeseph Bermudez has written extensively on the Tongchang-ri Launch Facility. Links to his and other articles on this facility here. 4. 38 North published this report by David Wright on the Tongchang facility. 5. Jeffrey Lewis at Arms Control Wonk. 9. Martyn Williams has published DPRK stamps of previous launches. This entry was posted on Thursday, April 12th, 2012 at 7:11 am and is filed under Military, Rocket Tests, Unha 3. You can follow any responses to this entry through the RSS 2.0 feed. Both comments and pings are currently closed. Thanks for taking some time to update!